It's been a long while since I've went to the mall since online shopping is way more convenient, but I'm glad I did recently. I wasn't expecting to find anything since I was also low key trying to save money, but I saw these flats. 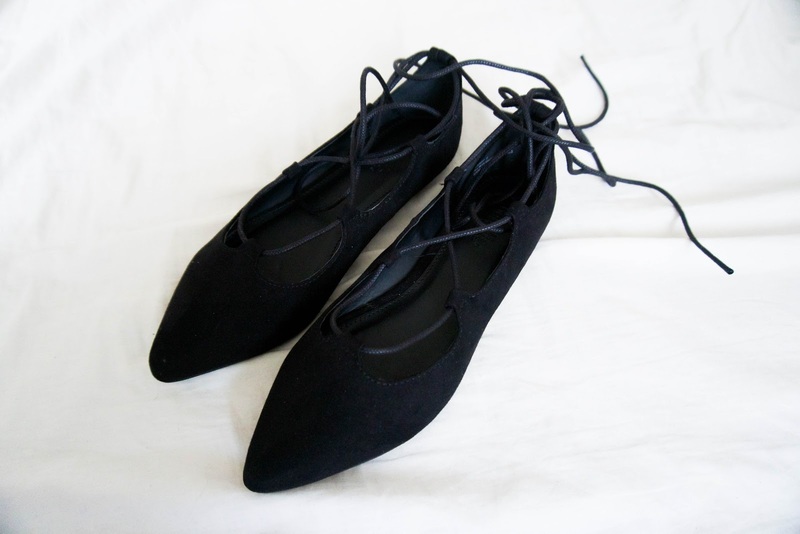 The most perfect lace up flats I've seen thus far are the Topshop ones, but I wasn't sure if I wanted them that badly. They're also $95 a pair. Even though this pair from Charlotte Russe isn't in leather, I really loved the shape and how the lace was placed. Some laces aren't in the way I want them, but these were pretty nice. They also fit me pretty nicely, and for a $22 price tag, why not? When the lady rang my shoes up, it said $12, which was a nice surprise. I didn't realize they were having that promotion for their shoes so it felt good knowing I scored a good deal. Who doesn't love a good deal?